← You’re Kidding! You Believe that God Became a Man? Do you dream? Or maybe I ought to say, do you remember your dreams because they say we all dream. It’s just that some of us remember them better than others. And there are pleasant dreams, and there are unpleasant dreams. 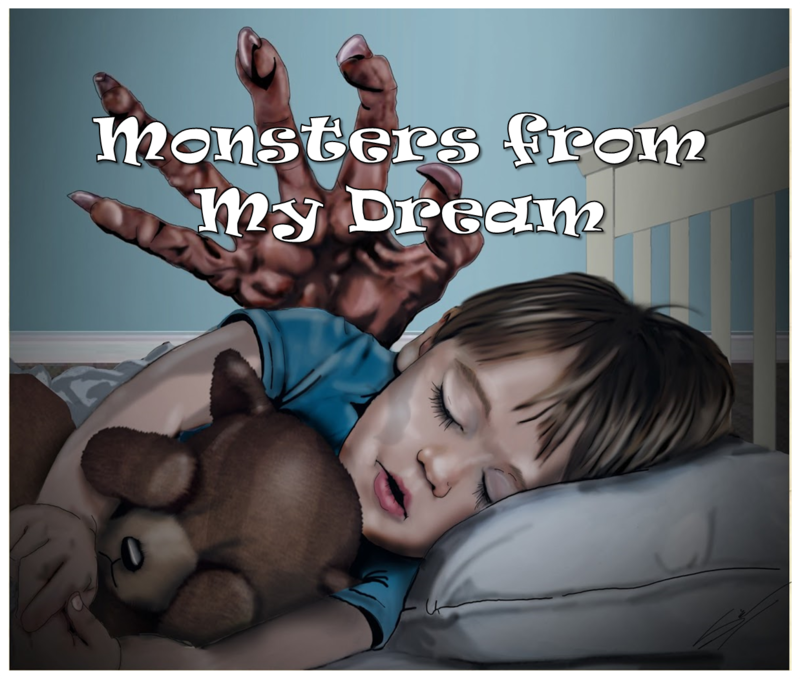 The unpleasant dreams we call nightmares, and unfortunately, those are the dreams I tend to remember. For example, I’ll never forget a recurring dream I had as a boy. An evil little gnome would creep into our house through the upstairs bathroom window and and chase me all the way downstairs, my legs moved slower and slower with each step I took, until I came to my parents’ room, and then he’d reach out and grab me by the shoulder with his paw, at which point I’d wake up with a jerk and try to calm myself down and go back to sleep. I dreamed that dreamed dozens of time as a boy, and then somehow I outgrew it. On the lighter side, I read a story about another fellow who had a recurring dream, similar to mine, that was ruining his sleep. So he finally went to a therapist to get some help. “So what do you dream?” the therapist asks. “Well, I’m running down this long hallway with a monster chasing me,” the man says. “That must be terrifying!” the therapist says. “Is there anything else you can tell me about it?” “Yeah,” the guy says, “when I finally get to the end of the hallway, there’s a door in front of me. But no matter how hard I knock or push on it, I can’t get it open.” “Really,” the doctor says. “Well, does it say anything on the door?” “Yeah, the guy admits. 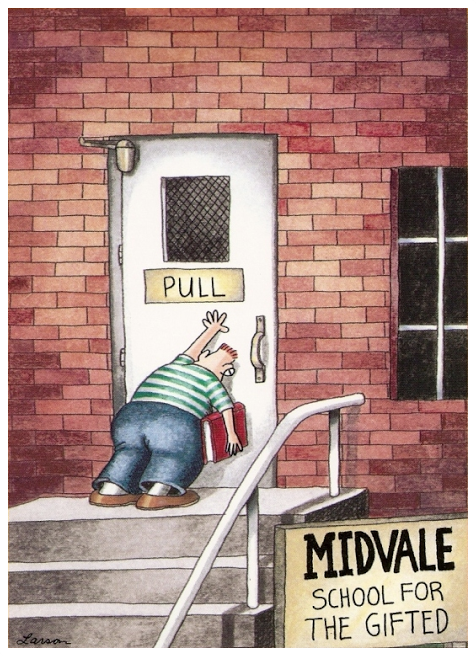 It says, “Pull. ” Reminds me of that old Far Side cartoon. Do you remember that? Tonight, then, we’re talking about a dream. Actually it’s more of a nightmare than a dream. Our passage is Daniel chapter 7 where we begin the visionary part of his book. So far we’ve focused on the personal section of his book where he describes the trials he suffered in Babylon and how by faith he overcame them. But now we’re near the end of Daniel’s life. He’s in his 80’s now and King Belshazzar, who’s the grandson of Nebuchadnezzar and a godless man, has no use for Daniel. But rather than let him lie on the shelf unused, God gives him series of dreams in which He shows him what will happen to His people in the future. And it’s not a pretty picture. Because instead of getting better and better, as humanists claim, man continues on a downward spiral which, apart from the grace of God, would end in our self-destruction. So as we study it, let it be with a sense of grief mixed with hope, because in spite of the wickedness of mankind and all our rulers, remember: “This is my Father’s world. O, let me ne’er forget, that though the wrong seems oft so strong, God is the Ruler yet.” Two points, then, as we study together. The first is God’s view of human history, and the second is God’s Lordship over human history. It may surprise you to know that this vision deals with the same information as Nebuchadnezzar’s dream in Daniel chapter 2, where God revealed to him the four great empires that would rule the world—Babylon, Persia, Greece and Rome. 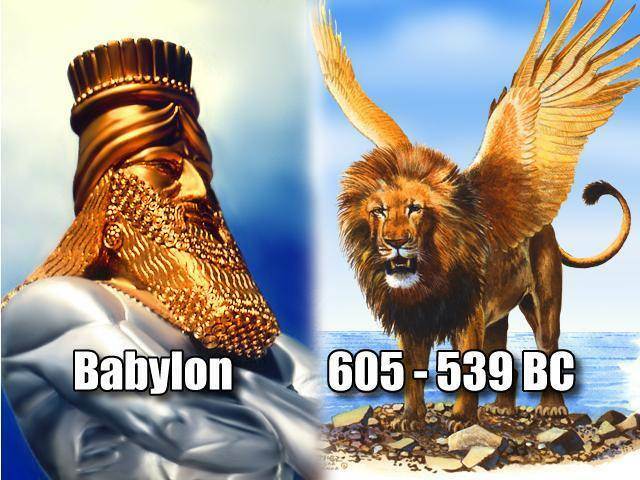 The difference between these two visions is that in Nebuchadnezzar’s dream, the kingdoms appeared as four different types of metal (gold, silver, bronze, and iron), whereas Daniel sees them as four different beasts—a lion, a bear, a leopard, and a terrible beast with teeth of iron. Why would God go over the same ground twice? Two reasons: The first reason is that in chapter 2, the kingdoms of the world are pictured as man sees them—glorious and impressive! I remember as a boy reading about the armies of Cyrus, Alexander the Great, and Caesar—and thinking, “What’s more impressive than that!” But I no longer see them like that. Now I see them as God sees them—as vicious, bloodthirsty beasts without an ounce of mercy and no respect for the God of Heaven. You can see that in verse 2 if you’ll look at it with me. 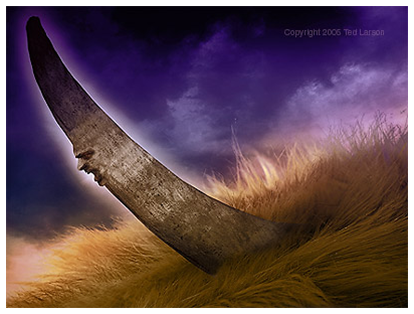 Daniel says, “I was looking in my vision by night, and behold, the four winds of heaven were stirring up the great sea. 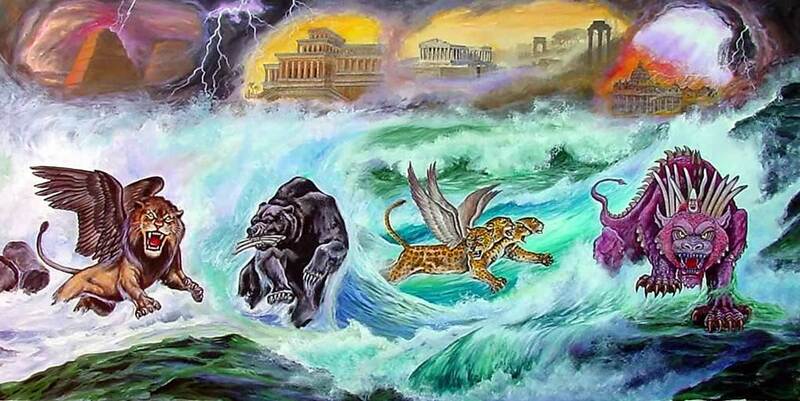 And four great beasts were coming up from the sea, different from one another.” First of all, what is the Great Sea? That’s important to know because it’s used again in the book of Revelation and whenever you see it, you ought to be thinking Mediterranean Sea,” because that’s the area from which all these empires came. Whereas, if you read of somebody coming out of “the Land,” like the false prophet in Revelation 13, think Israel, because the Land is the Promised Land, whereas the Sea is the Mediterranean Sea from which these four bloodthirsty and Gentile beasts have come. The first empire was Babylon and Nebuchadnezzar which Nebuchadnezzar saw as a head of gold, but now appears to Daniel as a hungry, winged lion. By the way, did you know that archaeological discoveries in Babylon have proven that their national symbol was the winged lion, just like the bald eagle is our national symbol today? And he goes on to say about it in verse 3, “The first was like a lion and had the wings of an eagle. I kept looking until its wings were plucked, and it was lifted up from the ground and made to stand on two feet like a man; a human mind also was given to it.” Wings symbolize the speed with which Babylon conquered its enemies, and the fact that its wings are torn off and it’s given the heart of a man—what do you think that symbolizes? 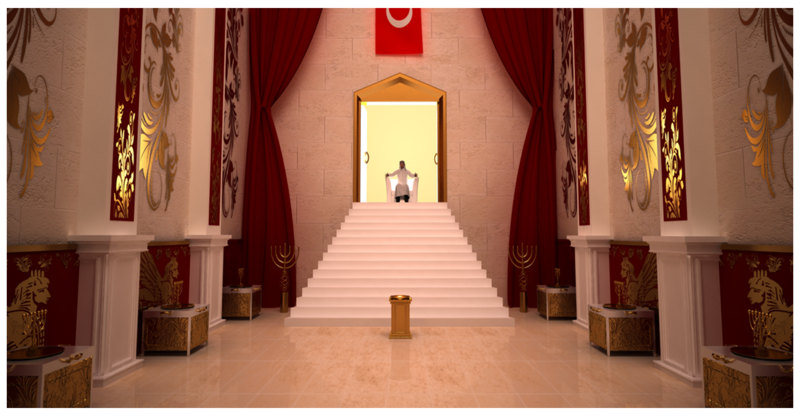 It symbolizes the great change that took place in Nebuchadnezzar’s life once he humbled himself and began to worship Yahweh, the God of Israel. 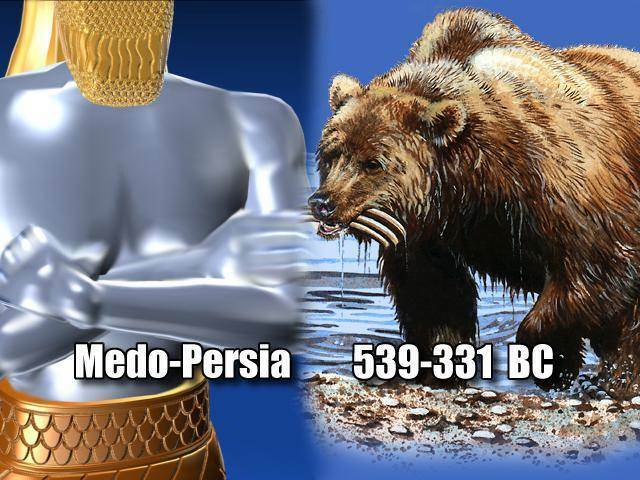 The kingdom that then replaced Babylon was Persia (Iran today) which looked to Nebuchadnezzar like a chest and arms of silver, but which Daniel saw as a hungry bear. Daniel says in verse 5: “And behold, another beast, a second one, resembling a bear. And it was raised up on one side, and three ribs were in its mouth between its teeth; and thus they said to it, ‘Arise, devour much meat!’” The reason the bear is raised up on one side is because the kingdom started out as an alliance between two nations—Media and Persia—but before long Persia became the dominant partner, whereas the three ribs in its mouth picture the first three nations they conquered—Babylon, Egypt, and Lydia. And yet, its appetite still wasn’t satisfied. It continued conquering until its power stretched all the way from Greece to the Indus River in Pakistan. 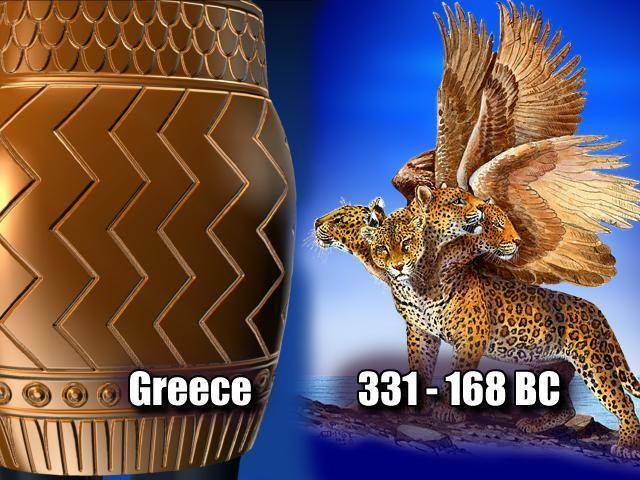 Then came the empire of Greece founded by Alexander the Great and seen as a belly of bronze by Nebuchadnezzar but as a four-winged, four-headed leopard to Daniel. Daniel says in verse 6: “After this I kept looking, and behold, another one, like a leopard, which had on its back four wings of a bird; the beast also had four heads, and dominion was given to it.” The four wings reflect the speed of Alexander’s army. He conquered the world by the age of 33 and then wept because he had no more worlds to conquer, and rather than leaving a son to inherit his kingdom, he died very suddenly and left the spoils to his four generals. That’s what’s pictured in the leopard’s four heads. Finally, Daniel sees a fourth beast so terrible that no creature on earth can compare to it. This is the kingdom Nebuchadnezzar saw as feet made of iron mixed with clay. But here Daniel sees it as a fearsome beast that crushes, devours, and tramples underfoot all that remains of the previous kingdoms. It’s also different in that it has ten horns. These Daniel explained, when he interpreted Nebuchadnezzar’s dream, represent ten kings and kingdoms that will rule the world together in the last days. That’s how God sees all the achievements of mankind—our great empires, our great cultures, our great monuments. When we look at them, we’re impressed. But God isn’t, not for a moment. He’s repulsed when He sees man’s inhumanity toward man. I’m thinking, for example, of Alexander the Great’s attempt to destroy the city of Tyre. Nebuchadnezzar besieged it for 13 years and still could not conquer it. The only one who managed to do so was Alexander who sent to all the neighboring countries like Israel demanding that they send provisions for his army. Israel flatly refused. So, once he ransacked Tyre, Alexander marched his army into the Holy Land, burned Gaza to the ground, and proceeded to Jerusalem where he planned to do the same thing. And yet, before he could get there, the Lord appeared to the high priest in Jerusalem and told him exactly what to do. So the next day, as Alexander approached the city with his army, the high priest came out to meet him wearing his priestly robes, followed by all the other priests dressed in pure white. The people of Jerusalem also came out to welcome him in white robes singing the songs of Zion. The gates of the city were then opened to him and the priest went on to show him in the Holy Scriptures what Daniel had prophesied about him. 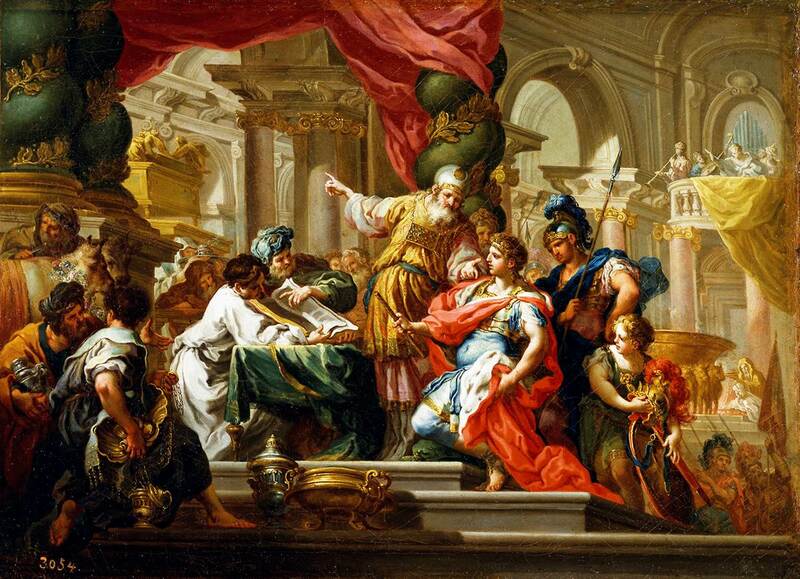 All of this overwhelmed Alexander so much that he knelt down and prayed in the name of Jehovah and offered a sacrifice on the brazen altar. He also went on to explain to the priest that before he left Macedonia, he saw all of this in a vision from the Lord who revealed to him that once he crossed the Dardanelles with his army, he’d go on to conquer all of Central Asia. It’s a powerful highlighting both the power and providence of Almighty God. But at the same time, don’t forget! If not for the gracious intervention of Jehovah, Alexander would have burned the Holy City to the ground, because he and his kingdom were nothing more than brutal beasts. The same thing is true of all the kingdoms of this world. They are led by people who are in love with power. Now I admit. Some nations have been better than other nations. But generally speaking, those who rise to leadership do so for one reason and one reason only. They love power. That’s why God describes them as beasts—because what they love is brute power. Lenin, the communist revolutionary, when interviewed on this topic, asked this rhetorical question: “What would it matter if two-thirds of the world’s population were destroyed as long as the remaining third became communist.” The first reason, then, that God repeats the same information here that He gave to Nebuchadnezzar in chapter 2 is to give His view of the world’s kings and kingdoms. He says they’re all vicious beasts! So right away there are several things that are obvious about him: 1) He’s a man because he has eyes like a man and a mouth uttering great boasts; 2) Since he comes out of the fourth beast’s head, it means he’ll aspire to be another Caesar and rule over the same vast area as Ancient Rome; 3) He will be the last world dictator because what will destroy him after his short reign of terror? 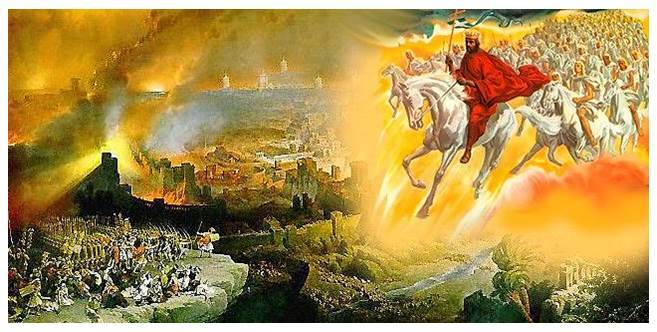 The return of our Lord Jesus Christ, which will bring to an end all the kingdoms of this world! In fact, if you drop down to verse 25, you’ll notice it says, “He will speak out against the Most High.” The language indicates that like Lucifer he’ll try to rise to the level of God Himself. Paul expands on in 2 Thessalonians 2 where he says he’ll take his seat in the Temple of God claiming to be God. But it won’t last long. Daniel says he’ll exalt himself and persecute the people of God for “a time, times, and half a time” (3 ½ years), trying to change the moral and natural laws of the universe, even the way we calibrate time. And the people of the world will go along with it. Having rejected the one true God, the Bible says they will worship the Beast because of the great satanic miracles he performs. So is it any wonder that God calls him the Beast? He will be the consummation of every evil and ugly thing this world has ever known. The history of humanity is blood-red with murder, war, and the persecution. And the famous names in our history books—Alexander, Caesar, Charlemagne, Napoleon—are there not because they were great philosophers, but because they were great fighters; not because they were peace-loving statesmen, but because they were bloodthirsty killers. And friends, there’s no indication that things will get any better. Instead, the Bible says just the opposite is true, which means our situation would be hopeless, if not for the second fact Daniel emphasizes. You can see that, first of all, in the rise and fall of each of these kingdoms. Alexander is a good example because what does it say about him in verse 6? Notice that last phrase. It says, “Dominion was given to him.” That’s what those in power tend to forget—and I include our present-day rulers in that as well—they forget that they didn’t get there on their own. The power they enjoy is a sacred trust given to them by Almighty God, and one day they’re going to have to give an account for how they’ve used it. Because over and above the fray of battling beasts is the God of Heaven resting upon His throne, watching and waiting with books open, ready to judge. One way that’s seen is in how perfectly all of this was fulfilled in history. God said there would be how many world empires that would rule the earth? 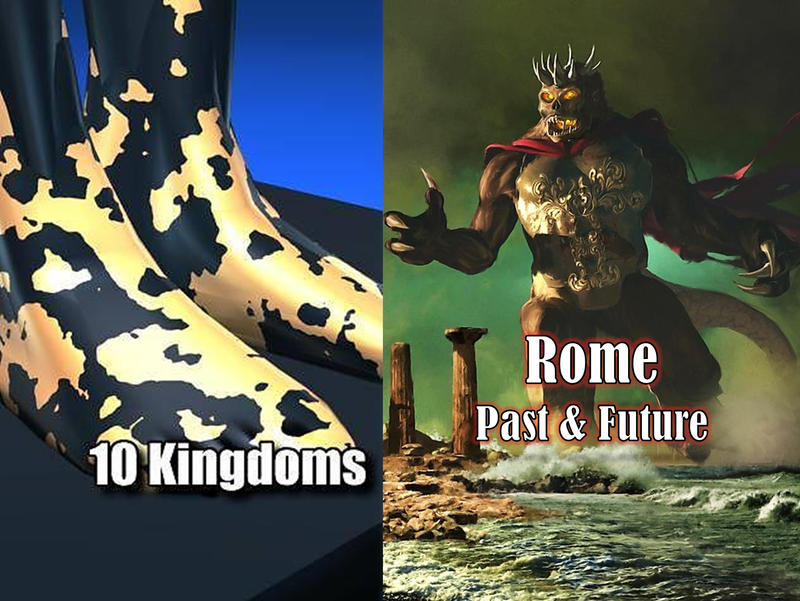 Four and four only—Babylon, Persia, Greece, and Rome! Many have tried to establish a fifth world empire—Charlemagne, Napolean, Hitler, the Soviet Union—but they’ve all failed. You say, “What about the British Empire or America today?” No, neither one comes close to the kind of empire Daniel has in mind. They’re simply the ruins of iron and clay left behind by the Roman Empire. God said there’d be four world empires, not five, and so far that’s all there have been. One day the fourth beast will try to rise again through the power of Antichrist, but he won’t last long—just 3 ½ years. Then what will happen? The great event we have been praying for all our Christian lives. 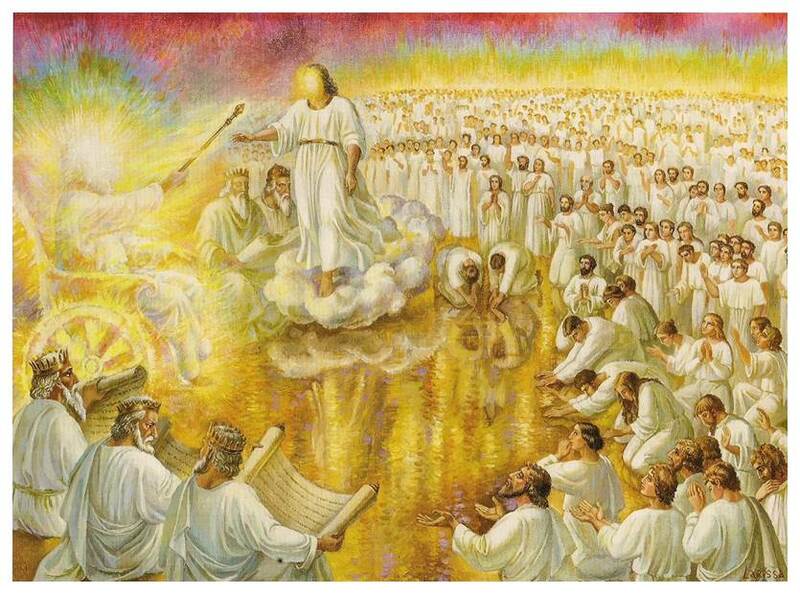 Jesus will return from heaven, and the kingdoms of this world will become the kingdom of our Lord and of His Christ! God’s kingdom shall come and His will shall be done on earth as it is in heaven. Daniel says, “I looked, and there before me was one like a son of man, coming with the clouds of heaven…the beast was slain and its body destroyed and thrown into the blazing fire…then the sovereignty, power and greatness of all the kingdoms under heaven will be handed over to the holy people of the Most High. His kingdom will be an everlasting kingdom and all rulers will worship and obey him.” Isn’t that great news! First of all, it means the peace on earth we’ve all been praying for so long. Consider this excerpt I read the other day from the Canadian Army journal. It says that since the world rejected the Prince of Peace by nailing Him to a cross, not one year has gone by without a war. In total there have been 14,531 wars, big and small, in which 3.6 billion people have been killed. England has been involved in 78 wars, France in 71 wars, Spain in 64, Russia in 61 wars, Turkey in 43, Italy in 25, Germany in 23, and man’s inhumanity to man goes on and on. But one day that will end. The Prince of Peace will return from heaven, and when He does, Daniel says, we who love Him will be given places of great honor in His kingdom. So if you pray for anything in the year ahead, pray for that and for your loved ones to be ready when He comes! He was right! 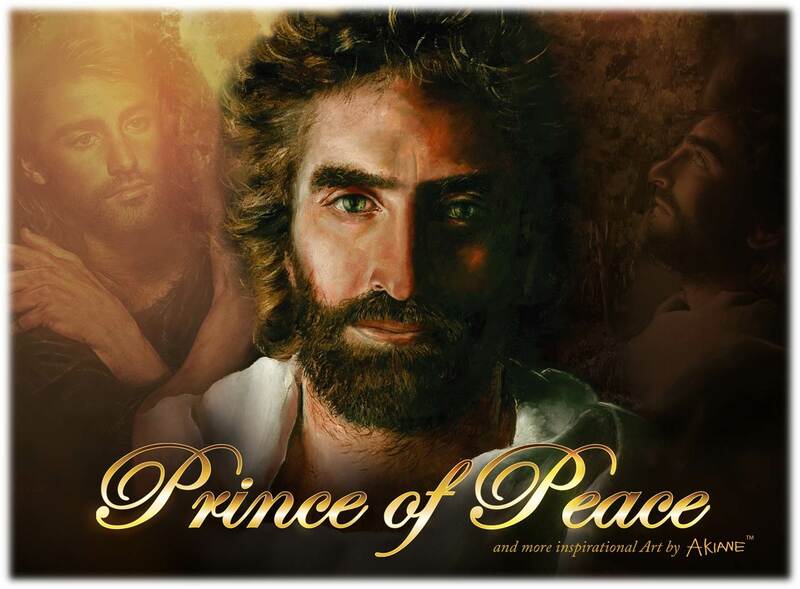 The only thing that will bring peace on earth, goodwill toward men, is the return of Jesus Christ, the Prince of Peace. So if, like Billy Graham, you believe this, start praying for His soon return more than you ever have before! To download the audio version of this message onto your computer, click Audio. This entry was posted in Uncategorized and tagged Bible, Christ, Daniel, Dreams, King, Nebuchadneszzar, Prophecy, Second Coming. Bookmark the permalink. You are right. We are not God. Jesus, the Father, and the Holy Spirit are God. We are merely servants and ministers of God. What about you? Do you love the God of the Bible? The Bible tells us that we can know God by believing in His Son Jesus Christ. Read John 17:3 (“And this is eternal life, that they know you the only true God, and Jesus Christ whom you have sent.”) and 1 John 5:11 (“And this is the testimony, that God gave us eternal life, and this life is in his Son.”) for help. Also read the verses before and after the ones I have cited above.